Visit our New On-Line Shopping Area, for a Glimpse of the Philippines. Casa Victoria features a Turo-Turo table filled with authentic Filipino Foods. From Breakfast to Dinner Casa Victoria has something for everyone. Enjoy a Combo Plate or Daing na Bangus with white rice. Click image above to view full menu PDF. We also sell traditional costume clothing for men, women, and children from the Philippines. 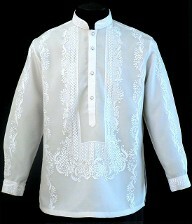 We carry the Barong, the national formal dress for men and women. Stop by Casa Victoria to experience a glimpse of the Philippines.